"Which Size Caravan or Motorhome Cover Will Fit My Vehicle?" To find which size cover will fit your vehicle you will need to measure the length of your vehicle. 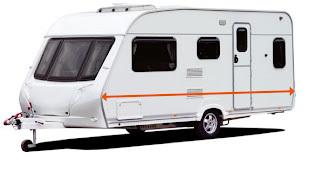 To do this, measure the overall body length of your caravan or motorhome (not including the a-frame on the caravan). Please allow room for aerials and other items that are on the roof of the vehicle, it is advised to add an additional 15cm (half a foot) to your overall measurement. Which size caravan cover will fit my caravan? To find the correct sized cover for your specific caravan, please measure the body length excluding the a-frame at the front. We have created a handy measuring guide which can be viewed here. Will a cover scratch my windows? In short, No. Many older style covers were made from very basic tarpaulin materials which could leave light hazing and blotches. All the covers available through our website are made of high quality polypropylene with soft inner layers which irradicates the problem of any marks being left on the window. Will a cover fit over my aerial? This depends on the type of aerial you have fitted to your caravan. If you have a domed areial without a spike, the cover will fit directly over without any alterations needing to be made. However, if you have an aerial with a spike, extra procaution will need to be made. In most cases, the spike will unscrew from the aerial and thus will allow you to fit the cover directly over. If however, the spike can not be unscrewed, it is advised that the spike is covered before fitting. This can be done in a number of ways, one of the most simple is to place a tennis ball which has a hole cut out which fits directly onto the spike. Alternatively, a small pot or bucket can be placed over the spike. All the covers sold through our website are waterproof and breathable just like your skin. Can you blow through your skin? Think about it! It is essential that the cover you purchase is breathable to allow moisture to evaporate from within the cover which prevents condensation forming. Can I gain access to my caravan with the cover fitted? Yes, full access to the caravan door can be used whilst the cover is fitted. Simply unbuckle the lashing straps which have a fast release mechanism and roll up the side of the cover. Which colour of cover is best? Some people say that grey is the better cover as it helps reflect the heat the the sun. Our most popular colour is green as it is a more natural colour which blends into the environment. In our opinion, the colour choice is entirely down to preference and the small benefits of choosing grey over green are hardly noticeable. Different covers have differing lengths of warranty. The exact length of warranty will be listed in the product description. The Explorer Caravan Cover has the longest with industry leading warranties. You can check out further details here. How much is postage and how long will it take to get to me? If the item you ordered is in stock, you can choose from either Next Day delivery at a cost of £9.95 or Standard 2 - 3 day delivery at a cost of £4.95. Please contact us for a shipping quote for international orders.